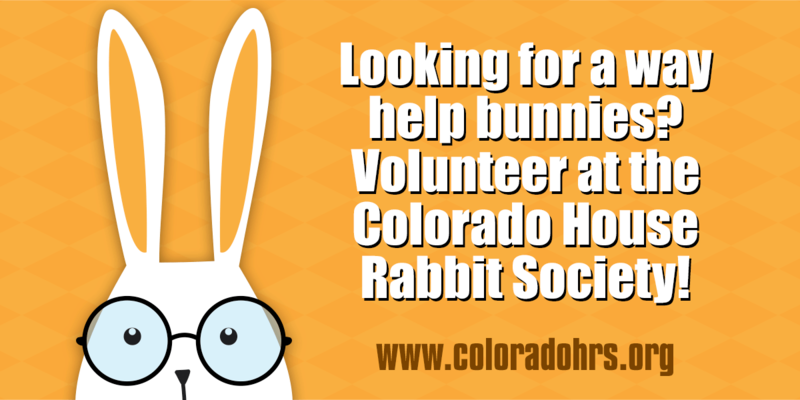 This post is for my pals at the Colorado House Rabbit Society. My daughter and I volunteer there and just recently the gal in charge sent out a call for help. Many of the college kids who had been helping had gone back to school and they were really low on volunteers to help with day to day tasks. If you are running a non profit this might happen to you from time-to-time too. It seems like it is either feast or famine and just when you think everything is humming along smoothly, your best volunteer drops out or your “team” decides to take a break all at once. Having a strong marketing plan for your non profit’s volunteer section is a way to smooth out those peaks and valleys! 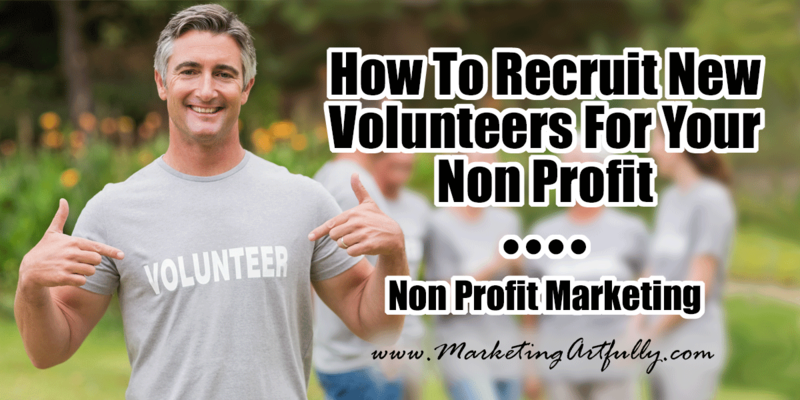 Here are my top tips for how to recruit new volunteers for your non profit. What Are The Benefits of Volunteering For Your Non Profit? Let’s jump right in and start talking about WHY someone would volunteer to help you. This is going to be key to your marketing materials so we might as well get it out of the way right off the bat! You might not have considered this, but most people will only do things that benefit them somehow, including volunteering at your non profit. Scheduling Benefits: The benefit for me volunteering at the bunny house is that it is only one weekend a month and I can show up anytime from Friday to Monday. Having talked to a couple of moms at the bus stop, that is a very tempting volunteer schedule, not requiring a rigid “every Saturday at 2PM” commitment. Who You Serve: You might be working with kids and some people love being able to help and mentor children. Or you might work with dogs and they have a special fondness for their furry friends. We will talk about this more later in the graphics section. People people: There are some people who just like to be part of a team. These volunteers will respond to a marketing message that talks about growing strong bonds with the other volunteers, having fun and generally getting to have friends and volunteer at the same time. Time with their kids: A lot of Moms want to spend time with their kids. I know that is a big reason that I volunteer with the bunny house, getting time with my daughter Desy. A lot of times a parent is required to be there so if the kid wants to volunteer they have to “put up” with their parent tagging along. TO DO…There are LOTS of other reasons why volunteers like to work with your non profit. First order of business is to ask a wide range of them why they volunteer. DON’T give them a list of reasons, leave it an open ended question so you can get all kinds of answers. You can ask them in person, send an email and ask them to hit reply, or send out a more formal survey to your mailing list using a free tool like Survey Monkey. Here’s something that you might not have thought of…people are nervous of new situations. Volunteering someplace you have never been before can be a traumatic thought to some people. With that in mind you need to make the process of finding out about volunteering crystal clear. On your website. 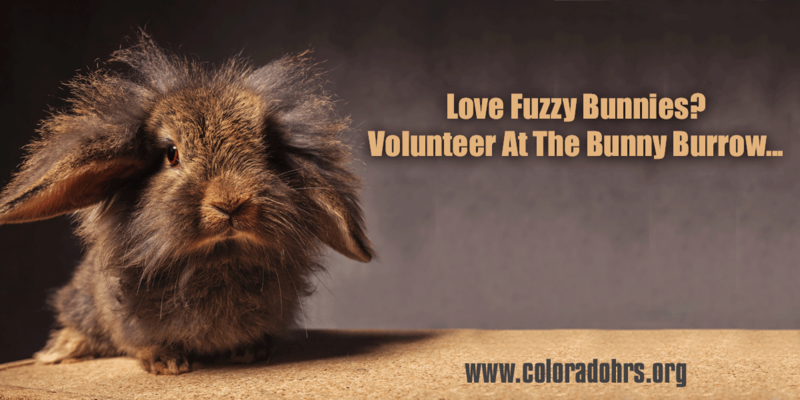 While I love my bunny ladies, their volunteer recruitment on their website is a little lacking. The button to find out about volunteering is “below the fold” meaning I have to scroll down to see it. Additionally there is no information about being a volunteer, just a huge, intimidating form to fill out. TO DO: Here are some things that should be super clear about your volunteer program! this should go on all marketing materials and on your website. Phone number. 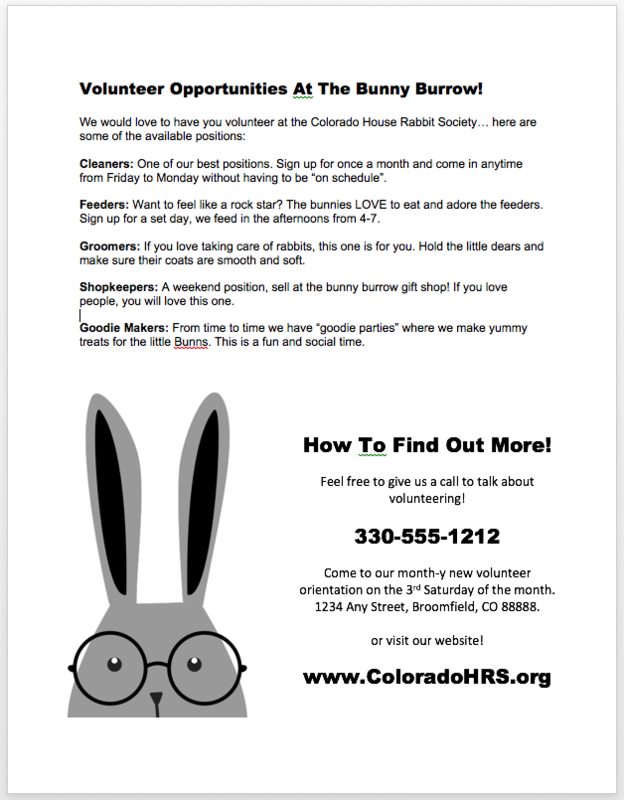 I would love to refer more people to volunteer at the bunny house but I have no idea how to get them to someone who could help them. I think it might be one gal, I could probably give them the main number or… Make sure you have ONE volunteer recruitment number that you give out. Have it prominently on the website, social media, etc. It is okay to have a recorded message on this number. Tell them the times and dates of orientations, let them know you will be giving them a call back within a couple of days and be really positive and upbeat, letting them know you are super excited that they might like to volunteer with your organization. At no time should you make it seem scary or intimidating to join your non profit. Remember, these are people who are freely giving their time to help you and they are humans so unanswered questions will make them stop and go find somewhere else to volunteer where they feel safe. Now that we know the message we will be sending, we can start to develop marketing materials that will support the mission. These are in no particular order and range from a little pricey (postcards) to free (social media). Direct mail is a super powerful way to send out a message to people who would find volunteering for you to be geographically desirable. While there is a cost to ordering postcards, oftentimes you can get local printer to donate or order them from Vistaprint when they have a sale. Then you need to consider postage which is about $.50 per piece. But wait, if you use Every Door Direct from the post office, that postage rate drops to $.17 a piece! The neat thing about this is that you are hitting an entire mail carrier route so you can target people who live in neighborhoods near you or where you have lots of volunteers living already. TO DON’T… This one is more of a “to don’t” than a “to do”. When you are spending that much to do a marketing piece, it will be tempting to try and get volunteers AND donors and talk a bunch about your mission. This is not the place for that. Simply tell them of the volunteer opportunity and give them a definite time to show up! 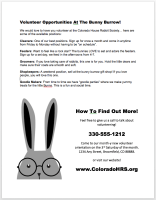 So I was at the bus stop the other day trying to explain to the other moms there where the bunny house was and how they could find out about volunteering and I thought, what if I had a flyer I could leave a bunch in my car or bring when someone asks about volunteering. This one is super easy and can be implemented quickly. Just create a flyer that has all the relevant details in Microsoft Word and then have a bunch printed out to give to your volunteers to hand out to friends and family. TO DO…Print out a bunch of flyers in black on colored paper. This will make them stand out from all the other “stuff” lying on people’s counters. You could also email them the Word document which might work too, but I would have a relentless campaign asking your volunteers to hand out a flyer to at least 10 friends. This word of mouth marketing would be a super powerful tool. One of my favorite things to use business cards for is as tiny little marketing pieces! You could put all your volunteer information on business cards and hand them out in the same way that you hand out flyers. The cool thing about them is that they are CHEAP (about $20 for 500), they are easy to keep around and hand out, AND they fit in a pocketbook or wallet so all your current volunteers can carry them around easily. Instagram is a little gem of a social media site. For me the best part is that when you use Instagram it also posts to Facebook and Twitter at the same time..whoo whoo. What to post. Instagram is all about picture and videos. I know at the at the bunny house there are the most amazingly cute rabbits ever. There should be daily posts with a picture of all the different rabbits, cleaners cleaning, feeders feeding, the sick bunnies we all can cheer for and the brand new baby bunnies that make us say AWWW. Whether you work with kids, dogs, old dears or the homeless, people love pictures. While it might seem intimating right now, once you get in the habit of taking pictures you will start to see photo ops everywhere! TO DO…Make sure that the link in your Instagram profile is for your volunteer page. YES, it would feel like they could search around and find it, but that is a tiny little screen and most non profit sites are not super mobile friendly. TO DO…It might be worthwhile to get a phone that is dedicated to just marketing. You can have volunteers take pictures and store them on the phone, then when you need to do a post, you just grab one and post. If you have to take them off the camera or send them to the phone you are much more likely to say “skip it” I am too busy today. While Instagram is all about candid photos, Facebook is a great place to launch an actual marketing campaign targeting volunteer recruitment. Banners. First off you want to have really pretty banners to use when you are sharing your recruiting message. You can put a fair amount of words on here as a call to action and post them on your business page. Make sure to ask your volunteers to “share” them onto their profile pages too! TO DO…You can go to Fiverr.com and have some banners made cheaply by the graphic artists there. In the top search bar just type in “Facebook Banners” and a bunch of gigs will pop up. It might be a good idea to hire a few different designers so you get a wide range of looks. Paid Facebook Ads. The nice thing about paid Facebook ads is that you can SUPER TARGET close neighborhoods and zip codes. That said, unless you are an advertising expert you can waste A LOT of money doing Facebook ads. Remember, there can’t be more than 20% of the ad with words so there is less room for a message. You need to make sure that the picture you use is eye catching and memorable. This is our “fuzzy bunny” ad that will appeal to people who think rabbits are cute! Events. Events are actually pretty cool on Facebook. You can set up an event and then invite your current volunteers to share it with their friends. I would recommend doing a monthly event for your volunteer orientation day. Make it fun with a theme like “hold a rabbit” or “get your picture taken with a Chihuahua”. Because Pinterest is more visual and long lasting, it may be tempting to use it. That said, I think that I would start with Pinterest only after I had a strong Instagram and Facebook presence. The reason I am less Pro-Pinterest for volunteer recruiting is that it is more global and would be less specific to your area. The impression that I have gotten from most non profit volunteer organizations over the years is that they are DEDICATED to doing great work, and are maybe not marketing experts. Well hopefully this helps! I tried to break down some of the main problems I see non profits having with their volunteer recruiting efforts and provide solutions and suggestions. Please don’t hesitate to leave a comment below if you have any questions about non profit volunteer marketing! YAY!!! Super happy to help the bunns!!! It is really amazingly easy once you have an overall plan and a campaign concept. PLUS they are wicked cute so who wouldn’t want to help fluffy bunnies! !